Pycnogenol is nature’s super antioxidant, reducing free-radical damage to the body in an easy-to-take liquid form. Originating from the lush forests of Southern France, Pycnogenol uses the active extract of French Pine Bark as a source of antioxidants, with more antioxidant potential than Vitamins C and E! These antioxidants scavenge free radicals within the body and reduce oxidative damage done to our skin, tissues, liver and overall health. 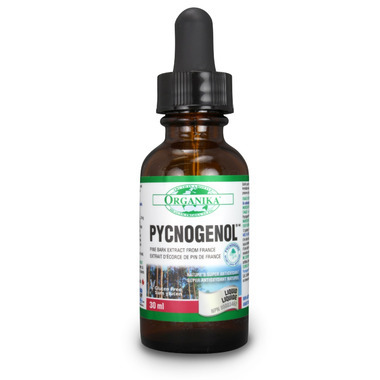 Oxidative damage can arise from dietary choices, stress and environmental factors; Pycnogenol helps to attenuate the damage done to cells and DNA. Directions: Take 12 drops (1 ml) under the tongue three times per day with meals. NON-MEDICINAL INGREDIENTS: Ethanol, Distilled Water. Consult a health care practitioner prior to use if you have multiple sclerosis, systemic lupus erythematosus, rheumatoid arthritis, or other autoimmune disorders. Do not use if you are pregnant or breastfeeding. I love this product. I have been using it for several years & feel that it does a good job of helping brain function & protecting my skin from sun damage.